Motorola RAZR MAXX promises better battery life | What Hi-Fi? Motorola has confimed that the new RAZR MAXX smartphone will be released in the UK in May. 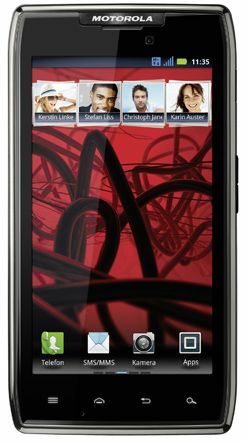 The RAZR MAXX promises a super-charged battery life, claiming over 17 hours of talk time before it needs to be recharged. Motorola insists the better battery life hasn't compromised the compact design and the RAZR MAXX measures in at a slender 9mm and weighs just 145g. The overall design certainly looks pretty similar to the most recent Razr smarpthone. The 1.2GHz processor and 1GB of RAM won't set the world alight but the 4.3in Super AMOLED screen with a 960 x 540 resolution sounds more promising. The Motorola RAZR MAXX is due to ship in mid-May and looks set to launch with Android 2.3 Gingerbread though an update to Android 4.0 Ice Cream Sandwich is in the pipeline.